Spicer transmission – lots of heavy duty trucks out there have them and we have a full line of transmissions ready to be shipped Worldwide. We have all types ranging from 5, 7, 9, 10, and 18 speed. If parts is what you need, then we have them too. Anything from rebuilt kits to spare, hard to find parts is what we specialize in. All of our products are ready for same day shipping around the world as soon as you call one of our experts. We will help you find the right transmission or part for your exact needs. 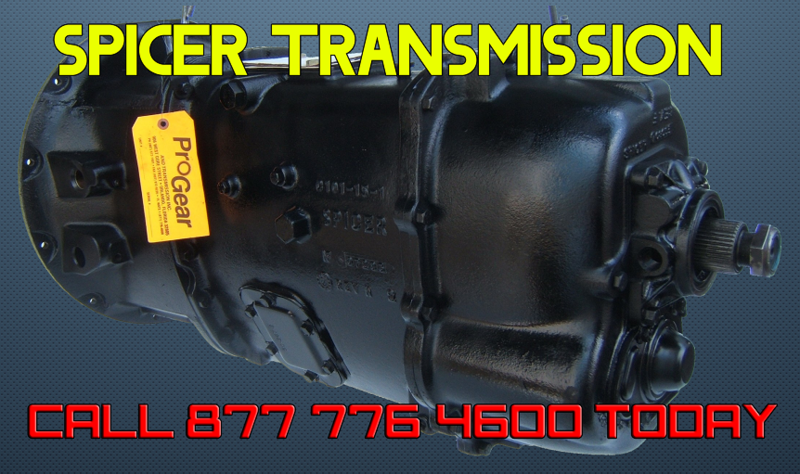 We offer new, rebuilt or used Spicer transmissions. Our reputation of rebuilding heavy duty truck transmissions is known well throughout the industry as the standard of rebuilding transmissions so be confident that when you get a rebuilt Spicer transmission from us, you will get a quality transmission comparable to the new ones from the manufacturer. Our parts warehouse is currently overstocked with transmission parts ready to be shipped at a moment’s notice so if you need a part, call us. Even if you are unsure what part you need, our parts experts are here to help you from finding what you need, until it arrives at your doorstep. We pay top dollar for Spicer transmission core returns. Rest assured that we will give you the most money for your return core when you get a new one from us. We can arrange the pick up as well so don’t worry about the shipping hassles. Rebuilt Spicer 5 speed transmission. Rebuilt Spicer 7 speed transmission. Rebuilt Spicer 9 speed transmission. Rebuilt Spicer 10 speed transmission. Rebuilt Spicer 18 speed transmission. Spicer Transmission ready to ship today!